Available Free at our counter here at New Again. Available Free when you have a Free Appraisal with one of our trained advisors. Right, so it's the BVRLA guide for Fair Wear and Tear? 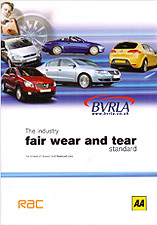 Yeah, it's the Fair Wear and Tear Standard guide from the BVRLA, you can't download these on the website. Oh I see, so they are not downloadable. So sometimes they'll provide them? This is us at New Again Chelmsford. 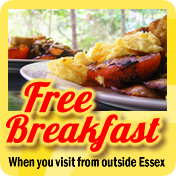 We're in Chelmsford Essex. Yep, that's it, you can come in and take a guide free of charge We'll also have a look at your car if you have any concerns about damage on the car. So we can advise you as well. Yeah we can advise you as well. You know, what falls outside the Fair Wear and Tear standard. Just a little note here to tell you that some lease companies don't work to the BVRLA guide exactly... this is the Fair Wear and Tear Guide you might be looking for... but what I would suggest is that to check with your leasing company that they are actually working to those guidelines, because some do work to them and some write out their own. Right, so now you've got the guide or you've got your standards, what do you do with it? So you get a clip-board or something so you can check it. Yes this is the one that you can print off from our website. You can print this off and then go around the car with your guidelines, either it be the BVRLA or your own contract. ...and then you're checking for the damage, so you cross-reference to the book, for instance a scratch which is 25mm or over, if you look in the book it could be a fail or acceptable. So the sills are important, lets have a look at the sills. These are bits where you get damage, underneath. Okay, what about under the front, they get scuffed under there don't they? Where else do people forget things? We're inside now, what are the main common things that people get caught out with? You get holes in carpets don't you? Missing parcel shelves is one I know of. Yep, Missing parcel shelves, locking wheel nuts, tools and the jack. What about the spare key? The spare key is a big one. Yeah that's one we find a lot of those missing. Service book! Now the service book has not just got to be serviced, it's got to be stamped hasn't it? If you haven't got it stamped or you've lost it you can go back to the dealer and get it stamped, where ever they got it stamped. I don't think there's a charge for that in some cases either. For what? the actual book? Yeah I think that's right we found that BMW was about £8 for a new book for somebody once. Holes where Parrot... hands-free has been. Sometimes you can check with your lease company and they'll let you leave those in won't they. That's another thing to ask them as it detracts from the value if you leave holes but if the thing is still in there and it works, it may add to the value. We've found some damage now, we've found something which is outside the Fair Wear and Tear Guidelines. What do we do? You keep looking. You mark it on your inspection sheet and mark it in the box and you keep looking because it's very easy to miss a bigger bit of damage. So what do I do the, just get it repaired? Just get it done the cheapest way on everything? No, you don't go for the cheapest, you need a proper repair. One of the things the inspectors will look for is previous signs of body damage or previous body repair. What does it say in the guide? In the guide, it's unacceptable for previous signs of body repair. So you can't have obvious signs of repair. It has to be repaired properly. Arron Cheap repairs show signs of repairs. 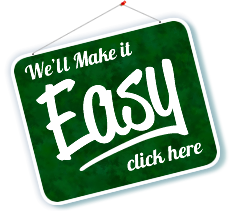 There's great useful tips on our website - clean-image.co.uk. Also we've got a panel that we've put together, which is called 'Ask the Experts', so you can actually put your photos on there and put the question to a smart repair guy. We've got dents on there, we've got a dents technician, we've got a wheel refurb technician, we've even got a bodyshop. We've got leather, trimmers, every sort of repair option, we've got an expert for. Because that's what I want. I want to give the car back and I don't want all the hassle -- I don't want to get a bill back from the lease company, what's the cheapest repair I can do? So I've dented this panel, this door and I've got a scuff on it, what do I do about that? Well you can't smart repair them panels because it's a door. Smart repair is designed for bumpers, body sills, wing mirrors, small areas. What does Smart mean? It's 'Small Area' isn't it? Yes it's 'Small/Medium Area Repair Technique'. And it's had a scuff done on this one, this is a lease car. It is a lease car. ...and we've done a scuff on this bumper. Yes, we've done a smart repair around this corner. And that's okay... obviously... because we did it. We did actually try and get the dent out on this car didn't we? Painted? What does that mean? The dent was pulled out with a welded bolt [a bolt is welded to the dent and then pulled out with a slide hammer ~ Ed], it was then skimmed [a thin layer of filler ~ Ed] and then resprayed across the whole lot [whole panel ~ Ed]. It's not smart Repair, no. It's in a controlled booth at a body shop. It was all masked up properly, all stripped down. I think it was about one-seventy-five plus the V.A.T. so not overly expensive. ...a lot less than it could have been if I'd given it back to the lease company. It's essential to have a copy of this guide if your lease company works to the BVRLA standard, as it shows you the difference between acceptable and unacceptable wear and tear for your car. It's very important to read the guide carefully rather than just looking at the pictures for guidance. The kind of damage that is chargeable can be slight, meaning it is difficult to photograph. So they have used pictures of quite severe damage. For example, the picture of the scratch on page 11 appears to be at least a foot long, but when you read the text is says that any scratch over 25mm (1 inch) is unacceptable. Furthermore, any scratch that has gone through the base coat is unacceptable no matter how small it is. The BVRLA guide is essential for all lease, contract hire and company car, drivers and we highly recommend getting one. Page 1Lease Guide index2 Your Responsibilities 3 Maintaining your lease car 4 Lease Return Inspections 5 Keys and Documentation 6 Car Body Damage 7 Scuffs and Scrapes 8 Plastic Bumpers 9 Dents and Dings 10 More Dents... 11 Scratches 12 Stone Chips 13 Exterior Trim and Fixtures 14 Wheels and Tyres 15 Windscreens and Glasswear 16 Upholstery 17 Interior Plastics Leather 18 Resources and Downloads 19 Why me? It didn't happen last time! 20 Crime Prevention 21 Are they out to get me? 22 Lease Return Recharge Gallery - Photo Examples 23 Manufacturers Faults 24 We are not Judge and Jury. 25 BVRLA Fair Wear and Tear Guide 26 Leasing Costs 27 Advice for Fleet Managers 28 Normal Inspection Process 29 Buying your Lease Car 30 What is a Threshold? A free checklist (PDF Format) to help you inspect your car, as per the motor industry standard fair wear and tear guide as laid out by the British Vehicle Rental and Leasing Association. Download, print it, copy it and give it to your friends. You can use this Manual as a summary of what is in the Fair Wear & Tear Guide, although we do recommend you buy one. of pounds when returning your lease car. A case study of a car inspected by Clean Image. Lease Return Article: More benefits of our lease return inspection. It's not just the money... There are many other benefits too! Lease Return Article: Why Drivers don't make good inspectors. Why drivers who inspect their own vehicles miss most of the damage. Article: Should I buy or lease my next car? Article: Car Leasing - There's no escaping the cost of high mileage. Lease return charges for excess mileage can be a real headache, we look at some ways to minimise mileage use and avoid recharges. Our list of resources - leasing and contract hire companies, fleet management, vehicles inspections, lease swaps, exchanges, advice.